Tiny boats heading to the coast at full speed seemed somewhat unreal. Prancing on storm waves the boats with assault groups aboard rushed landward by leaps and bounds. What daredevils shipped out in ugly weather on such floatage! 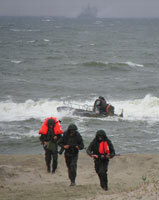 Brief "hovering" at coastal wave, jump in water – and first meters of coast is already occupied by marines. Several assault groups simultaneously get out from helicopters hovered over water and coastline. What a horseback action! And when two small amphibious air-cushion ships menacingly approach the coast in a few minutes (who named those giants "small"?!) and a sweeping-all-before camouflage "wave" rushed out of their bellies, it becomes apparent that no one can ever stop this power. According to exercise scenario, marines involved in this phase of Zapad-2009 were supposed to act in three environments. Amphibious debarkation, armor sailing from large amphibious ships and air attack were performed there. "Wish we could show everything", complains Capt. 1 rank Yury Kuroedov, Baltic Fleet Assistant Commander on information support. Due to bad weather the exercise program is forcedly corrected. Unfortunately, parachute assault of marines and airborne groups, as well as armor sailing from LAS is fulfilled nominally. But all those activities were minutely trained during pre-final stage, repeatedly executed at tactical drills conducted under the exercise program and general combat training plan as well. By the way, they were performed jointly with all branches – naval forces, aviation, artillery, signals. There were no doubts about professionalism of our servicemen and their ability to accomplish any task. I met marines of BF Guards independent Marine Brigade 336 after debarkation episode at Khmelevka range. Seamen were adjusting arms, vehicles and equipment under supervision of their commanders and sharing impressions with each other. The seamen speak about their work without any pathetic. They mostly tell about preparation and drills. Guys were really crocked up at that time. They were hardly managing to dry up "hats" – changeable uniform – after sequent drills with sea "bathing". Therefore, marines acted faultlessly during the exercise. Everyone who was observing the landing operation could not deny fineness and cohesiveness of landing assault actions. Worth-saying is an interest fact – nobody turned sick after that "swim"! "They must be rugged", laughs Guards Seaman Ivan Kharlanov, senior scout of recon assault company. Ivan is probably right, as tempering serves its purpose here. But not less important was the role of splendid skills. Same example, Ivan Kharlanov is an experienced marine. He serves under contract currently and spent his regular term also among "black berets", but in Caspian Flotilla. Being a Caspian marine, Ivan accomplished combat tasks along with his unit and was awarded with Cross "For Caucasus service". Contractee Kharlanov considers current exercise another important life's milestone following Chechnya and Dagestan mountain operations. Ivan's servicemates Yury Khvostov and Vasily Shilov are also proud of landing at Khmelevka range, as among observers was Supreme Commander of Russian Armed Forces Dmitry Medvedev. Like their servicemates, scouts tried to show President the best of Marine combat performance. Those guys have not demean the sonorous name of "black berets". BF independent Marine Brigade 336 was organized in 1979 succeeded BF Marine Regiment and became heritress of WW2 Infantry Regiment 347 and Guards Infantry Regiment 336. Stalingrad and Orel battles, forced crossing of Dnepr, assault of Bialystok are in the unit's combat chronicles. General award list of the Guard Brigade includes 15 commendations of Supreme Commander, 3 565 medals and 2 Heroes of the Soviet Union. In peaceful time the marines have been participating in numerous large-scale exercises including international ones. They have been bearing active service in seas and oceans accomplishing special tasks. Few people know that during woeful epoch of the USRR collapse brigade's servicemen almost 4 years had engaged in defense of important naval objects and memorials in Baltic republics. The brigade's personnel took part in the first Chechnya campaign as well. Over thousand marines were awarded with medals for courage and bravery displayed, and four men became Heroes of Russia. During mission on constitutional reinstatement at North Caucasus, 46 "black berets" died hero's death. Today's Brigade 336 is: active service aboard, participation in Victory parades in Moscow, international exercise BALTOPS, distant cruises, anti-piracy operations. It is a famed unit in Baltic Fleet carrying out number of tasks. Madcap attack with thunderous firing and voiceful battle cry – that's a seaborne assault from action movies. But actual tactics of marines while assault of enemy coast is anything but such cine stereotypes. The fundamental of "black berets" real combat is good judgment, cohesiveness and perfect interaction. And all that is the result of thoroughly trained drills and intensive military study. But prowess is necessary too, of course. There's nothing to do without it in Marine! "We open fire in approach to the coast", Guards Seaman Yury Khvostov explains particularities of vanward tactics. "We define line of fire upon shot flashes of defensive side and localize enemy firing-points. After landing we operate in combat twos and threes: some advance by rush-and-crawl, some cover them. Present combat training program in BF "black berets" brigade is more than saturated. And that is not only Zapad-2009 preliminaries. Brigade ranges and various drill sites are never disengaged due to endless field and fire drills, tactics, physical training etc. Brigade combat training plans are executed strictly, not considering circumstances. And without self-deception. For instance, if physical training is scheduled for independent recon assault company – it means mandatory daily 5-km run. That's why all guys of this company and in brigade are tough as one man. Without personal preparedness it's impossible to serve in Marine which is the vanquisher of three environments. "Only under airborne training program the brigade personnel had performed over 3 000 parachute jumps this year", says Guards Col. Alexander Anosov, Marine Brigade Commander. "Combat training is the basis of day-to-day activities". Except training and daily duties, combat service activities are also organized in accordance with established plan. Among them are anti-terror activities and maritime navigation security. Only in 2008 brigade's personnel covered about 100 000 miles during combat missions! In current year this parameter exceeded 50 000 miles. Drills of combat service are also formed on scheduled and permanent basis. BF Marine Brigade started "Baltic" phase of Zapad-2009 in full strength. "We had our people among landing troops, vanguard and airborne assault", says Col. Anosov. "Our artillery battalion accomplished tasks of counter landing defense. Brigade anti-aircrafters took part both in debarkation from air cushion vessels and in antiairborne defense. Medical personnel landed and deployed mobile hospital". Only logistic and technical support units did not participate directly in landing operation. But they were saddled by maintenance of technical facilities, logistic support of personnel, arrangement of living conditions, advance of ammunition, fuel and other supplies. "Actually, our rear echelon is also fight-capable and it has special transport as well", specifies brigade commander. "But this time tactical employment of those units was not provided". Guards Brigade Commander assessed actions of his subordinates as good. "High controllability of the units is worth distinguishing", states Col. Anosov. "All given tasks were accomplished accurately, although there were plenty of contingencies. For instance, weather brought changes, but the reaction was immediate. Finally, all time requirements were promptly fulfilled. It is recognized that Brigade 336 conducted Zapad-2009 exercise in a new look. Number of units was reformed during pre-exercise period. But there were no bad changes, considers brigade commander. Rather, previously reduced units have displayed positive results. What is worth think about is technical equipping. And Zapad-2009 once again showed the necessity of its improvement. "It would be good to enhance fire power", says Guards Col. Alexander Anosov. "APC is currently a transportation facility for us. We need more weaponed vehicles for fire support of attacking marines. Such systems exist: for example, BMP-3 and BMD-4. And for us as marines it's critically important that those vehicles show good performance afloat. It is fair to say that rearmament and reequipment of brigade are in progress. New comm facilities were recently delivered; there are advanced battalion and company command vehicles in the brigade. They "fought" at Zapad-2009 having received a sort of "fire baptism". By the way, representatives of manufacturing companies could hear comments and wishes of those who appointed to deal with the armament. Fortunately, the criticism was not significant. What must be also reviewed is individual equipment, say commanders. For instance, the issue of armor protection is extremely urgent. Not common armor vest but… floating one. Such equipment has already been designed and its samples were shown to Supreme Commander at Khmelevka range. Example, armor vest Korsar-MP which is buoyant by means of composite materials. Currently used regular marine's life vest is not perfect just because of its scarlet color as it is excellent clue for enemy. Korsar and its backpack provide camouflage, protection, comfort use and positive buoyancy, what is the main feature helping to land successfully and engage. "Armed Forces consist not of abstract subdivisions and formal documents but of people serving to our country", said Russian President Dmitry Medvedev at awarding ceremony in Kaliningrad to servicemen distinguished themselves during maneuvers. Human factor was also discussed at tea table under army tent during President's meeting with servicemen. Among those attending the talk were marines from BF brigade as well. As they say, the conversation was interesting and straight. The President listened attentively to wishes of soldiers and seamen, answered their questions. Guard Senior Sergeant Vyacheslav Ogerok, squad leader of maintenance platoon was there and ask president about social welfare improvement. This inquiry is not idle for contract-serving personnel. Apartment rent in Baltiysk costs 8-10 thousands. Vyacheslav's fiancee, nurse of local hospital with 5 000 salary was recently dismissed. Not overmuch for two, right? What if they have kids? "Remuneration and quarterage are the main problems must be solved and hopefully will be settled in nearest future", said Snr Sgt Ogerok. Issues of effective social welfare of military servicemen are under development, said Dmitry Medvedev at the meeting with servicemen. In particular, contract servicemen will obtain quite worthy salary, as the President said. In addition, pay procedure of housing lease compensation will be updated. All attendants of the meeting were awarded with memorable wristwatches – participants of Zapad-2009 exercise check time by them now. Baltic "combat" time becomes time of changes, time of hope for whole Russian Army and Navy. "Military maneuvers Autumn-2009 had been conducted since June till October, 2009. Within the framework of these maneuvers, the exercises Kavkaz-2009, Ladoga-2009 and Zapad-2009 were completed. Currently, combined forces operational exercise with participation of Caspian Flotilla and Kazakhstan's Navy are in progress. The maneuvers are to be finished in Kazakhstan by joint exercise of CSTO operational response forces. Certainly, the year's most meaningful event was Zapad-2009 exercise. Its outstanding feature is that planned actions of Russian and Belarusian forces were actually realized afield – first in Russian territory, then in Belarus. It must be noticed that all units operated as one team and executed all tasks given. Summarizing the exercise's results, serious outputs were made. First, we could fulfill number of tasks afield by combined grouping (Army, Air Force and Navy) both in Russia and Belarus. It should be stressed that during Zapad-2009 exercise we proved our views on Armed Forces reorganization. Second, all commanders and staffs completed practical tasks afield. The exercise has been very dynamic. We deployed troops by railway, air, and sea transport; troops marched many times as well. Almost all range of combat actions was trained – both defensive and offensive, including tactical airborne assaults, amphibious landings and coastline security. Therefore, almost all branches took part in the exercise. Obviously, there were some negatives. We reached two conclusions while testing new methods of tactical activities. First – warfare became to be extremely dynamic and flexible. Frequently, there are no clearly defined defensive or offensive front lines, so tactics itself and operational use of troops have been fundamentally changed. Considering that, we want every general and officer to understand it and be able to operate in new conditions. Second conclusion lies in following: to fight and accomplish missions in new conditions, corresponding weapons and military equipment is necessary. For example, we tested new multirole fighter bomber Su-34, helicopters Mi-28 and Ka-52, improved fighters Su-27 and Su-24, attack aircraft Su-25. They appeared to be excellent and reliable. But there are some problems in delivery. Military Industrial Complex should implement number of projects before we receive exactly those systems which are currently urgent. New command structure was also seriously tested. Three-link system (brigade – operational command (army) – strategic command (military district) equaled the hopes put upon it. That turned to be very reliable, simple and effective command structure. Undoubtedly, our soldiers did themselves justice. There were neither complaints against difficulties nor incidents happened at these days. This fact once again confirms – when troops do their work, it improves quality of military training, military discipline and day-to-day activities. Almost all plans of exercise were executed. We see that we are on the right track. Overall results of Autumn-2009 maneuvers will be reported in November".